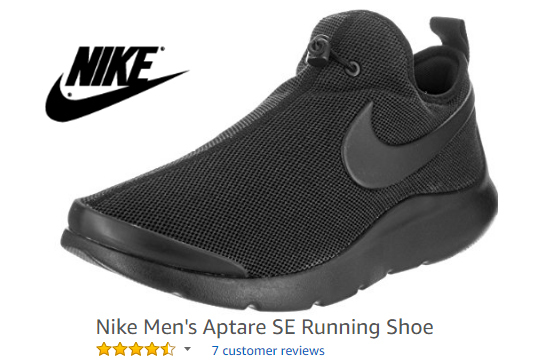 Nike Aptare running shoes with no strings. It’s a good thing to see that Nike is focusing more and more on the undiscovered segment of the sneaker market: running shoes with no strings. Not especially for Nike, but for us as customers it’s good to have a wide variety of sneakers designs to choose from. Shoes are possible one of the most personal clothing items you wear. You choose them with care because you want them to last for a while. Almost everybody has sneakers, even the pope has a pair of Nike Legend Blue Jordans for his daily exercises. As they are extremely easy in use and can be worn in lot’s of different occasions. Some sneakers, like this Nike Aptare has the look of proper walking shoes. The running shoes with no strings attached have the design of an official shoe. Especially the black Aptare SE, this because of it’s toggle bungee closure system. Which makes an perfect alternative for the classic shoe strings. The Nike Aptare has a pull tab on the end of the heel to help you slip out your shoo easier. It also preserves the shoes better as every body has the tendency to remove one sneaker with the other by stepping on the back side. Not a good idea! The shoes are made from textile and rubber which makes them perfect for vegans and vegetarians. As there is no leather or animal products used by the fabrication of the trainers. The design of the Nike Aptare is based upon the classic Nike Free. This time however Nike eliminated the shoelaces to simplify the design. And in the end it worked the Nike Aptare are indeed minimalist running shoes with no strings.